I just wanted to take some time to post some recent finished work along with some of my inspirations. 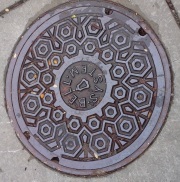 Having a camera on me at all times is really great, and bonus- people probably think I’m nuts for stopping to take pictures of sewer covers. It’s these everyday things that I’m referencing in my jewelry because they are evidence of inevitable urban and industrial decay. Enameled pendant. Chasing/repousssee gave me the dimension, I then pierced and enameled the piece. 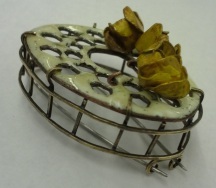 The gear flowers are recycled steel I enameled and attached with copper tubing. Distorted sewer cover brooch. 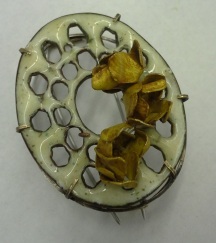 The flowers are recycled metal, painted with cadmium yellow acrylic paint. Cadmium is an element that is a common pollutant in those brown fields that I mentioned in my last post. I'm Sarah Loch-Test, an artist from Columbus, Ohio. I've been making jewelry for as long as I can remember! I like to have fun with my work and combine childhood obsessions (like Dinosaurs!) with elements of design and craft that inspire me. 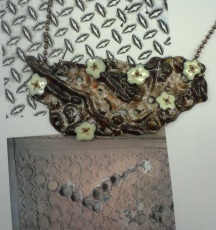 Art Nouveau, Islamic and Indian craft are my favorite sources of inspiration and I hope you can see that in my jewelry. My work can be found at the Mac Worthington Gallery, The Columbus Cultural Arts Center and on permanent display in Northland High School. I'm a graduate of the B.F.A. craft program at Kent State University, concentrating in Jewelry Metals and Enameling. I sometimes get distracted and work in other mediums such as felt or will do some sewing. I've been in shows and exhibitions at Kent State, the SNAG Conference and around the Columbus Area. You can view other work at www.SarahLoch-Test.com Find my on Facebook: www.facebook.com/SarahLochTestJewelry Twitter: @SarahLochTest Currently I'm in Pittsburgh, PA at the Society of Contemporary Craft, where I am the first ever Studio Apprentice. I'll soon be moving to North Carolina, to start grad school at East Carolina University.